Micro-Macinazione is a Swiss company providing micronization services and technologies for the pharmaceutical and fine chemicals industry. To learn more from the interview with the leading micronization services and equipment provider please download their latest brochure. 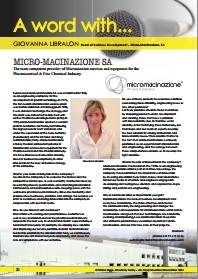 Giovanna Libralon: Business Development Manager, Micro-Macinazione S.A.